"HEARKENING BACK TO A TIME THAT NEVER EXISTED"
Era: Early 1950’s. West Coast steam. Locale: Central Valley on bottom deck and the Sierras on top deck. Minimum radius: 30” in visible sections - one 28” curve in staging. Track: Mainline code 83, branch code 70. Roadbed: Homasote on ¾” plywood. Average Train length: about 10 –12 cars. Basic Physical Structure: Railroad is double decked around the walls with a peninsula. There is hidden staging underneath the main yard and on a double tracked helix. Staging is accessible in either direction from the bottom deck. Both decks have loops for continuous running. Aisles are 30” mostly. Deck widths are 24” bottom around room and 18” top around room. Deck separation between railheads is 20” Railhead heights are 40” and 60”. Lighting: Compact Fluorescents in porcelain sockets. Helix construction: ½” plywood cut in ¼ circle sections stacked on wood risers. Track is laid directly on plywood. 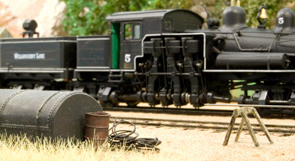 Electrical: 12 gauge DCC buss, feeders to most track sections. Switch motor power supply: wall warts in series to provide a bipolar to ground supply. Connections are soldered.